Southwest Marine, Inc., San Diego Division, recently drydocked the Navy vessels USS Thach and USS McCluskey together for extensive repair work. The dual docking occurred in accordance with tight Navy schedules in order that the two vessels could rejoin the fleet as quickly as possible. Southwest Marine, owner of one of the most technologically advanced floating drydocks ever designed, was the successful bidder for the repair work for the two Navy combatant frigates, which are similar to the USS Stark. According to Capt. Richard Ames, Supervisor of Shipbuilding, Conversion and Repair, U.S. Navy, San Diego, "This dual docking of both ships at once required exceptional cooperation and coordination of efforts between Southwest Marine and the Navy." 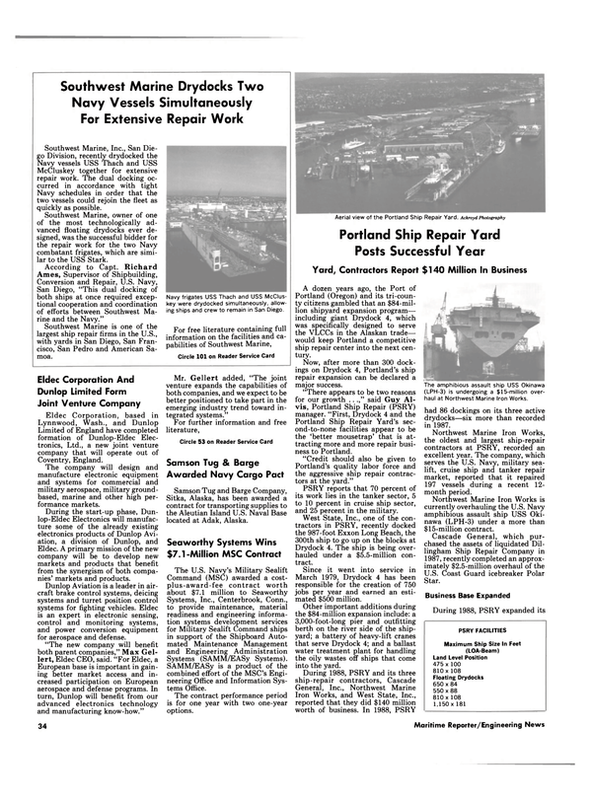 Southwest Marine is one of the largest ship repair firms in the U.S., with yards in San Diego, San Francisco, San Pedro and American Samoa.